Use code holiday2018 at checkout for 15% off November 22 through January 1st, 2019! 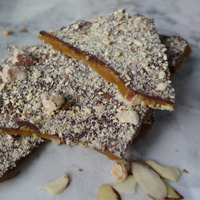 Amazing homemade toffee any time, any day! "I've had all of the flavors and honestly have no idea which I like most. 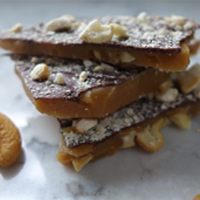 Such detail and care go into each batch, it's as if Teri tries to outdo herself each time, though I'm not sure how much more delectable her toffee can be!" "This toffee is amazing, the best I ever had! You will not be disappointed. Great for holiday gifts." "I had to hide the toffee I got for my birthday from my family, because they were fighting over every piece! So amazingly delicious! "Good doesn't even begin to describe Teri's toffee. Her toffee is the perfect treat for any occasion, so be sure to stock up! You will not be disappointed. 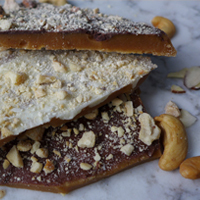 Teri's toffee is an essential in my family's house." We only make small batches of toffee for the finest quality and control over every aspect of the process. From fresh dairy butter to our high quality chocolate, Teri is always in search for the best. 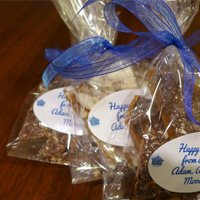 We offer presents, holiday gifts, and party favors with gift receipts and personalized notes. Contact teri@teristoffeehaus.com for more gift order information. You won't be disappointed by the delectable taste of our products, so try some today!